If I had to list one of the most popular gifts we’ve been asked for or given, it would hands-down be LEGO gifts. This goes for kids and big kids alike. When we were invited to E’s friend’s birthday party, we knew he loved LEGO too, so the kids both picked out LEGO gifts, but we decided to take it one step further with this Unique Way to Wrap Gifts for LEGO Lovers (plus some LEGO gift ideas at the end). This post contains affiliate links. 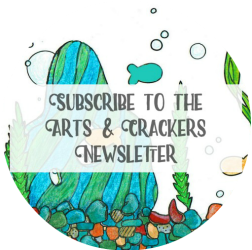 By purchasing through these links, you help support the family behind Arts & Crackers at no added cost to you! Thank you! My kids are both like me and love to make everything extra thoughtful. E’s gift idea was the best and we were so excited we were able to make it possible. E is all about making LEGO Minifigures that look like specific people. We didn’t have all the pieces to make one just like his friend, though, and ordering parts would have taken too long. When we found Brickcloneme, which is owned by a 10-year-old LEGO lover who has tons and tons of bricks (and ways to get specific bricks needed), and he will create a custom look-alike Minifigure for you! He did an AMAZING job. E paid for it with his own money, and we were excited to support a kid around his age! I’d totally share the side-by-side picture with you, but I didn’t ask E’s friend’s mom for permission yet. Make a LEGO Sensory Wall for your child’s bedroom or playroom! As I tried to figure out how to wrap these gifts, my creativity would not stop bugging me. “Find a unique way to wrap gifts!” it shouted at me. I couldn’t just throw them in a gift bag (because it meant I would have to go buy one). I didn’t want to wrap it in the only wrapping paper I have…Christmas paper. Then I stepped on a LEGO brick. Ouch. But it gave me an idea. How cool this gift would look if it looked like a LEGO brick! If you are using a specific LEGO box size, you’re good to go! The drone 3-in-1 kit was the one we used, and it was perfectly-sized. Because we also had the small brick and I wanted it to coordinate, I found a granola bars box that matched the width, and I cut it to look like a square brick. Measure and cut your wrapping paper. You can use other colors than orange if you want to. Gatorade caps happened to be the proper size and shape I was looking for, and those are all orange, but you can look for similarly-sized caps and match those colors to offer a variety of bricks. One other cap I believe would work are Mott’s Apple Juice caps (the big bottles). If you have a smaller gift to wrap, this could give you an even bigger variety of caps to try, too. You could even spray paint some caps so you can offer different LEGO brick gift colors. Tape the wrapping paper neatly onto the boxes. If you’re using a box that you’ve cut the end off of, measure and add a neat crease where it will fold over the open end, so it looks neat. In our time constraints, we had to stick with Gatorade caps as-is. We found some on clearance and stocked up. The boys each had one while we were out and about all day. My husband brought one to work. They all shared others, then we used one bottle to fill up all of our ice pop and ice cube molds so we have fun Gatorade pops for sick days or play-outside days! We didn’t want to waste the bottles, so we actually filled them up with different amounts of liquid and some food coloring in rainbow order, and we used a reusable straw to tap them and make music! After our gift box was wrapped, we used hot glue to attach the two boxes together. Place the clean caps onto the top of the boxes to see how many you’ll need and where to place them. Carefully hot glue the bottom of each cap, one at a time, and stick them onto the places you decided on the top of the wrapping paper. Since I stacked boxes, I did not put caps under the smaller box, so we only had to use 6 caps. To go one step further, I used a matching permanent marker to draw the bottom of a LEGO on the bottom of the bottom box. Both of my boys wanted to give their friend a card, so we let them each choose one. I used coordinating cardstock paper and a large circle paper punch to make six bumps for the top. On each, instead of writing LEGO, I wrote something that had to do with birthdays using a slightly darker permanent marker. Place each of the circles on the envelope to see where you will place them, then use mounting squares to attach each so they appear to turn the envelope into a 3D LEGO brick. Have you seen this neat Build Me “Emotions” set from LEGO Education? Kids and adults will love this unique LEGO gift wrapping idea! What other creative gift wrapping ideas do you have for gifts for LEGO lovers? P.S. you can totally use the same concept as the LEGO envelopes to make LEGO brick gift bags! Looking for more? View these categories! birthday, craft, DIY, fun, gift ideas, kids, Lego, party, wrapping. Bookmark.